Our intent is to provide compassionate, state of the art, quality veterinary medical dermatologic care and superior professional customer service to our clients, their pets and their general practice veterinarians. 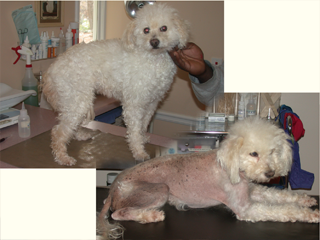 Our desire is to be the preferred veterinary dermatology referral practice in Metro Atlanta. Our focus is on EXCELLENCE in providing compassionate quality medicine in an environment that emphasizes pet focused professionalism and superior customer service. Our team of dedicated professionals aims to empower our clients through education as we meet the needs of the pet, the client and the referring veterinarian. Voted "Best in Atlanta" in the Veterinary category for the past four years, we are honored to have been selected for this distinction. The staff at AVSAC has enjoyed being"THE dog and cat skin doctor" for thousands of pets for over 24 fabulous years! THANK YOU ATLANTA FOR YOUR SUPPORT! As with humans, disorders of the skin in pets can be chronic in nature so we strive to form a bond of trust that will enable us to care for your pet for as long as needed to find the CAUSE of your pet's condition while improving his or her quality of life. We will keep your family veterinarian informed of our progress and the treatment plan uniquely developed for your pet's condition. At this site, you will find information about our practice philosophy, our services, helpful forms to assist you when you are ready to visit, and answers to frequently asked questions. Thank you for taking the time to read about our veterinary practice and the services we offer. We welcome your comments and suggestions and are ready to help you help your pet! Please contact us at (770)936-8922. CHECK OUT THIS VIDEO ON CLEANING YOUR PETS EARS! Ear canals are lined with skin and are thus under the same skin disease influences that affects skin elsewhere on the body. Proper cleaning and care is vital for gaining and maintaining good ear health. Do you know the proper technique for cleaning your pet's ears? Watch this video to learn the best gentle technique for keeping your pet's ears healthy! AND TREAT YOUR PET AS OUR OWN!